The following constraint provides a general way of defining any constraint involving sequences whose checker, i.e. a procedure that classifies ground instances as solutions or non-solutions, can be expressed by a finite automaton, deterministic or nondeterministic, extended with counter operations on its arcs. The point is that it is very much easier to come up with such a checker than to come up with a filtering algorithm for the constraint of interest. In the absence of counters, it maintains domain consistency. Corresponds to regular/6 in MiniZinc. The sequence of terms of interest; abstract grammar category sequence. A template for an item of the sequence; abstract grammar category template. Only relevant if some state transition involving counter arithmetic mentions a variable occurring in Template, in which case the corresponding term in a sequence element will be accessed. The signature of Sequence; abstract grammar category signature. The automaton is not driven by Sequence itself, but by Signature, which ranges over some alphabet, implicitly defined by the values used by Arcs. In addition to automaton/[8,9], you must call a constraint that maps Sequence to Signature. The source and sink nodes of the automaton; abstract grammar category sourcessinks. The arcs (transitions) of the automaton; abstract grammar category arcs. Any transition not mentioned is assumed to go to an implicit failure node. An arc optionally contains expressions for updated counter values; by default, the counters remain unchanged. Conditional updates can be specified. A list of variables, local to the constraint; abstract grammar category counters. A list of initial values, usually instantiated; abstract grammar category initial. A list of final values, usually uninstantiated; abstract grammar category final. N is unified with n, computed such that: if the value Later occurs in the Signature, then First occurs n times before the first occurrence of Later, otherwise n=0. N is unified with the number of (nonempty) stretches of any single value in the Signature. N is unified with the number of stretches of values matching ValuePat (abstract grammar category valuepat) in the Signature. N is unified with the number (modulo Mod) of stretches of values matching ValuePat (abstract grammar category valuepat) the Signature. N is unified with n, computed such that: if values matching ValuePat (abstract grammar category valuepat) occur the Signature, then n is the length of the longest such stretch, otherwise n=0. N is unified with n, computed such that: if values matching ValuePat (abstract grammar category valuepat) occur the Signature, then n is the length of the shortest such stretch, otherwise n is a large integer. N is unified with the number of words matching WordPat (abstract grammar category wordpat) in the Signature. N is unified with the number (modulo Mod) of words matching WordPat (abstract grammar category wordpat) in the Signature. If the prefix of the Signature matches WordPat (abstract grammar category wordpat), then ZO is unified with 1, otherwise with 0. If the suffix of the Signature matches WordPat (abstract grammar category wordpat), then ZO is unified with 1, otherwise with 0. For a signature of length k, the constraint is implemented by decomposition into k smaller constraints mapping an old state to a new state. The states are represented as domain variables. StateSequence forms the list of these k+1 domain variables, starting with the initial state and ending with the final state. 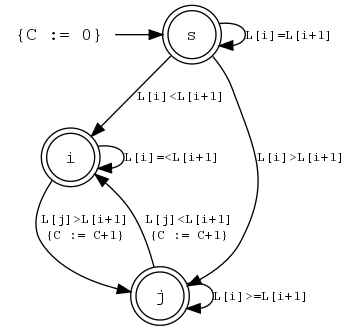 Map gives the interpretation of their values: it is a list of pairs Node-Value such that if the nth state variable Sn equals Value, then the automaton is in state Node having read n symbols. Similarly to the list of states, CounterSequence forms the list of the k+1 instances of Counters, beginning with Initial and ending with Final. If no counters are used, then the arguments Counters, Initial and Final should be . The arguments Template and Sequence are only relevant if some Expr mentions a variable in Template, in which case the corresponding position in Sequence will be used at that point. Signature is the signature corresponding to Sequence. The finite automaton encoded by SourcesSinks and Arcs stops in an accept state. Any counter arithmetic on the transitions map their Initial values to the Final values. Any extra constraint imposed by Options are true. Here is an example. Suppose that you want to define the predicate inflexion(N,L,Opt) which should hold if L is a list of domain variables, and N is the number of times that the sequence order switches between strictly increasing and strictly decreasing. For example, the sequence [1,1,4,8,8,2,7,1] switches order three times. The following piece of code encodes this using automaton/9. The auxiliary predicate inflexion_signature/2 maps the sequence to a signature where the consecutive element order is encoded over the alphabet [0,1,2]. We use one counter with initial value 0 and final value N (an argument of inflexion/3). Two transitions increment the counter. All states are accept states. | ?- inflexion(N, [1,1,4,8,8,2,7,1], ). This constraint uses techniques from [Beldiceanu, Carlsson & Petit 04] and [Beldiceanu, Carlsson, Flener & Pearson 10]. The following constraint is a symmetry breaking constraint for removing value symmetries. holds if for all adjacent pairs v,w in Values, either w does not occur in Vars, or v occurs earlier than w in Vars. Values should be a list of integers, and Vars should be a list of domain variables, with no restriction on their domains. Corresponds to value_precede_chain/2 in MiniZinc. If false (the default), then the constraint is implemented by decomposition to automaton/3. If true, then a custom propagator is used. Both methods maintain domain consistency, but their relative performance may vary from case to case.